Oopsie Bread Recipe — The Low Carb Dessert Bread You've Been Waiting For! If you’ve tried many low carb recipes, chances are you’ve dabbled with an oopsie bread recipe — a low carb bread that’s loved by some/disliked by others. Whichever side of the fence you fall on, I guarantee you’re gonna love this oopsie bread keto recipe! 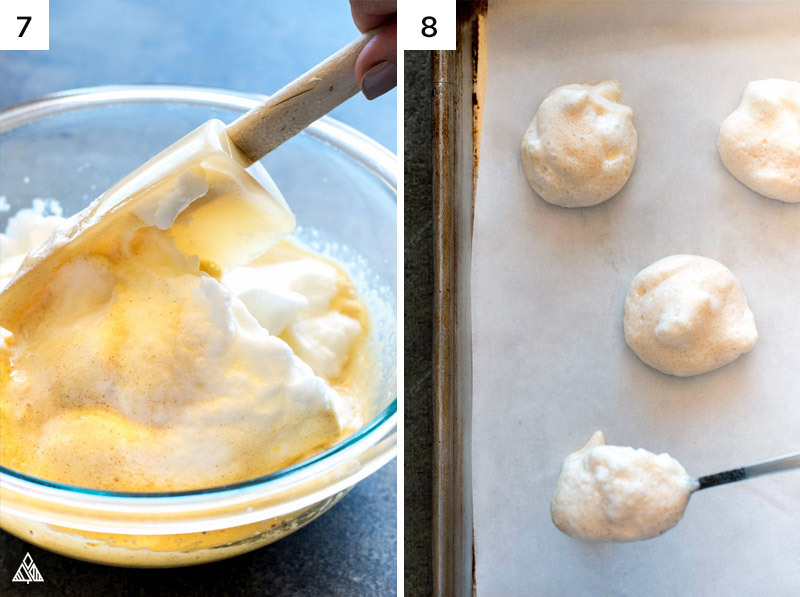 Because unlike the recipe you’ve tried in the past, this oopsie bread recipe is a dessert bread — as fluffy as a donut, and as sweet as a breakfast pastry. The frosting adds a delicious cream cheese flavor, top it with some low carb fruit and you’ve got yourself a delicious, sweet, decadently delicate treat any pastry chef would be proud of! I can’t wait to hear what you think about this oopsie bread recipe. Now, let’s get baking! Before delving too deep into this oopsie bread recipe, I’d like to mention that oopsie bread is meant to be bread-like and doesn’t taste exactly like bread. It’s delicious, but if you go into this expecting a French baguette, you may be disappointed! That said, I’ve received many incredible oopsie bread reviews! People use this oopsie bread recipe as low carb hamburger buns, sandwich bread, or turning it into a dessert — get creative! 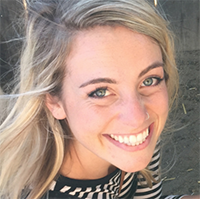 One glance at the oopsie bread nutrition below will make you never want to turn back! Eggs: This is what adds the “fluff” to our oopsie bread recipe. Cream of Tartar: This helps the eggs form firm peaks, but don’t worry, you won’t be able to taste it, promise! Cream Cheese: This adds to the base of the bread. If you don’t have this on hand, make oopsie bread without cream cheese using cottage cheese or low carb greek yogurt — I will say I MUCH prefer the taste of this oopsie bread recipe with cream cheese. Erythritol: My favorite keto sweetener. 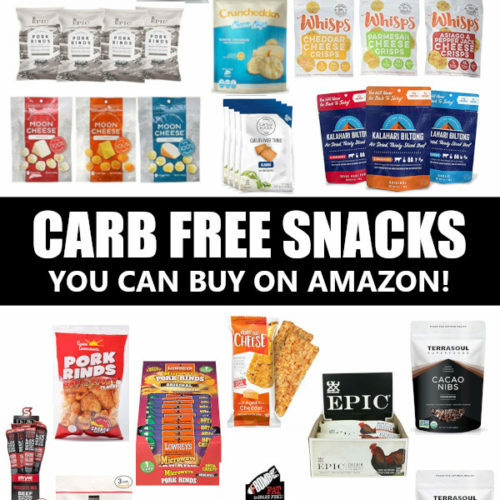 If you don’t have erythritol, or if you prefer another low carb sweetener, use that instead! First, and most importantly, when making oopsie bread, it’s all about getting the egg whites as fluffy as possible. 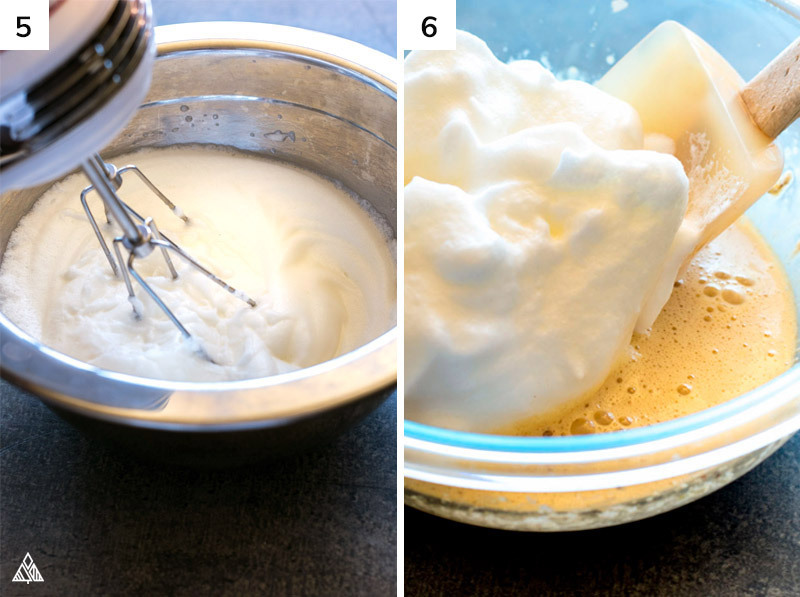 You’ll need an electric hand mixer for this, and a little TLC in handling those egg whites! 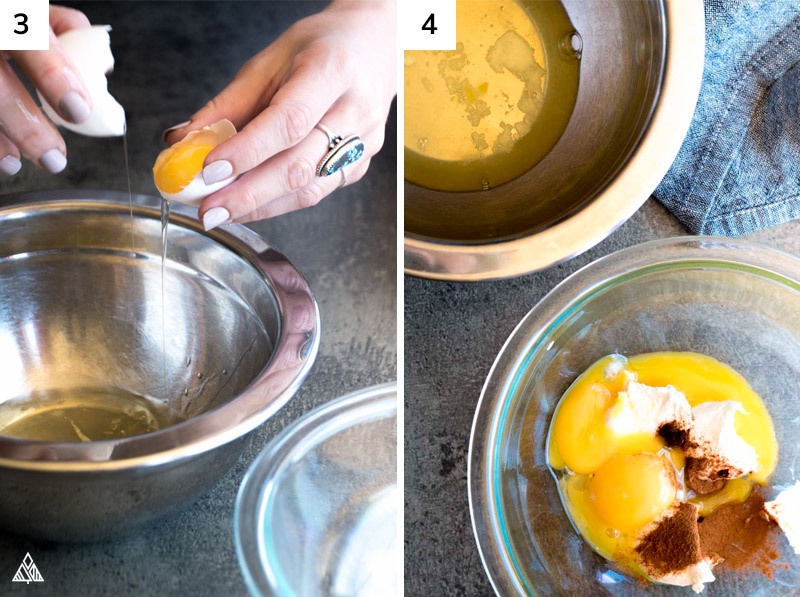 I mix the egg yolk bowl of ingredients first, since they’re less temperamental. Then clean and dry the mixing beaters — you don’t want to mix the yolks with the whites or it’ll be harder to achieve what we’re looking for. 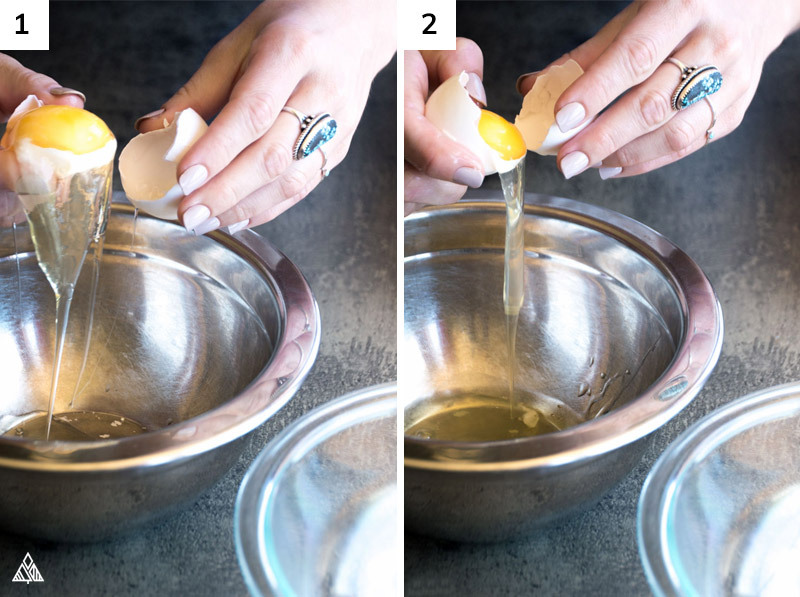 Beat the egg whites and cream of tartar until they’ve reached firm peaks — meaning, your egg whites stand up straight when you lift the beaters out of the bowl. Be sure to mix in all lingering egg whites by moving your beaters around, there may be some hiding at the bottom of your bowl! Gently, using a rubber spatula to fold the oopsie bread recipe ingredients together. Only handle these ingredients as much as you need! We want to keep as much air in those egg whites as possible. Using a spoon, add a dollop of the oopsie bread recipe to a lined baking sheet. Keep in mind that oopsie bread doesn’t rise much! So what you add to the baking sheet is what your bread is going to look like. The closer to the bottom of the bowl, the more you may notice the mixture becoming more liquidy — I found about 2 scoops worth in my bowl. You can either throw this out, as it won’t fluff up like our other rolls, or place it on a baking sheet. It’s actually really delicious, especially with some sweet cream cheese! When it comes to how to store oopsie bread, I keep it in a ziplock in the fridge. I’ve even frozen oopsie bread with great success! I’ve read many forums and recipes suggesting that doing this will make this oopsie bread recipe taste more bread like the next day — which I haven’t found this to be true, but if that has worked for you let me know! The frosting is optional. While testing this sweet oopsie bread recipe, all I could think about was my Mom’s red velvet whoopie pies! Hence the cream cheese frosting — although not the same, this oopsie bread recipe is kind of like a low carb whoopie pie! 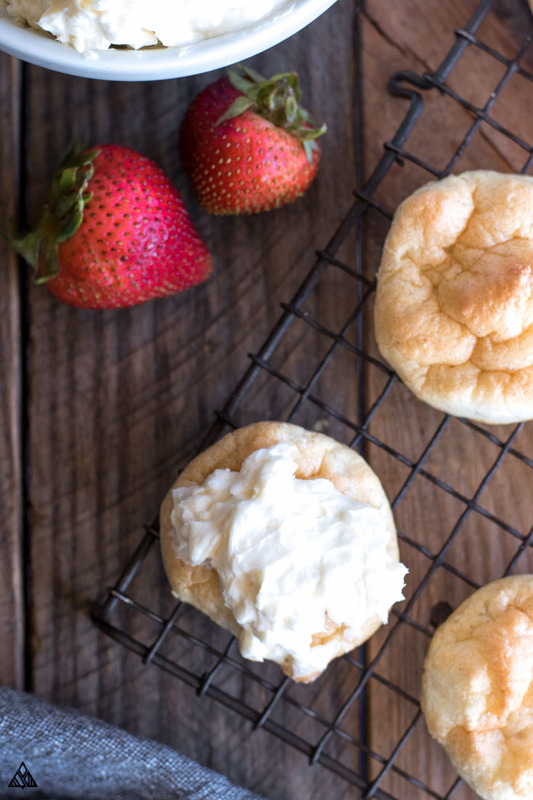 If you’re making this sweet keto cloud bread for a low carb dessert, try one of these variations to fit what you’re craving! Low carb chocolate: Add a piece of low carb chocolate to the top of this oopsie bread recipe before you toss it in the oven. Whipped cream: Check the nutritional labels, but often sugar free whipped cream is low in carbs and is great to top your oopsie bread recipe with! Low carb fruits: strawberries, blackberries and raspberries are on the lower end of the carbs in fruit spectrum. Now, this low carb frosting + keto fruit sliced on top is absolutely divine! 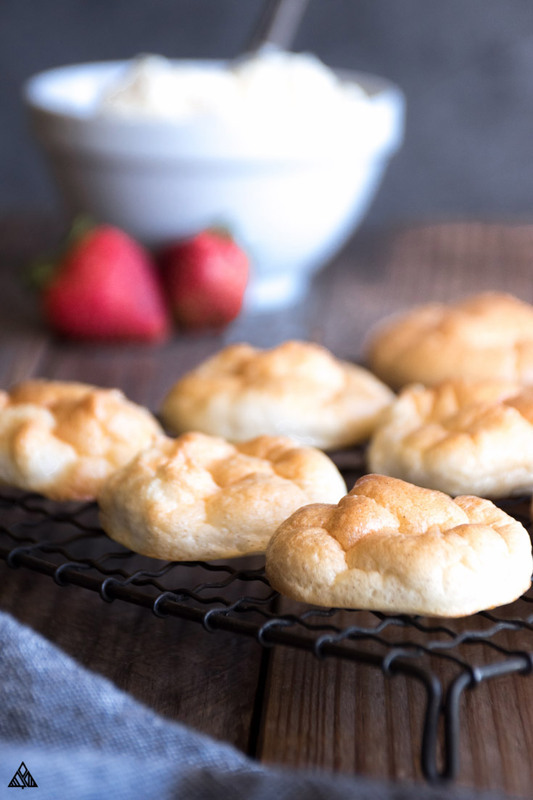 I hope you love this cloud bread recipe! Let me know what you think in the comments below! 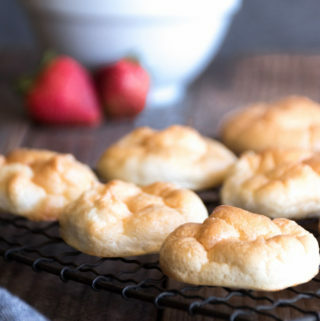 Did you top your cloud bread recipe with anything delicious? 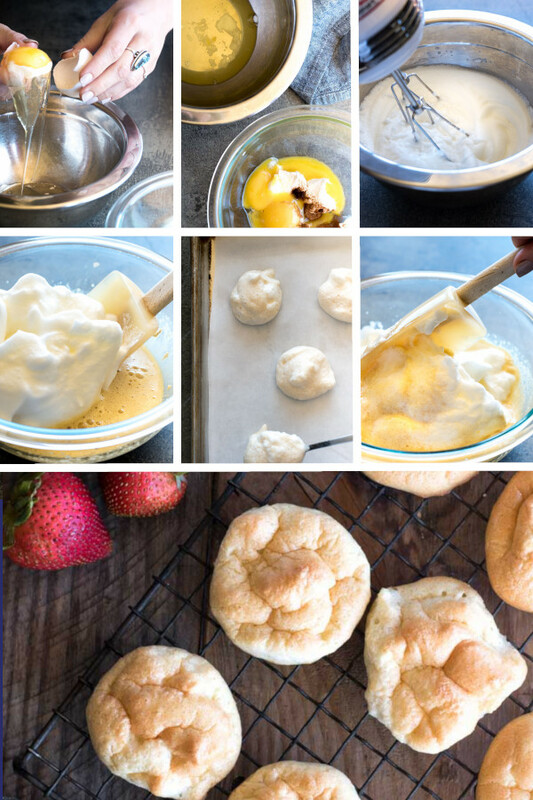 This dessert oopsie bread recipe is as fluffy as a donut, as sweet as a breakfast pastry, and so delicately delicious any pastry chef would be proud! Grab the butter and cream cheese for the frosting, and place them on the counter so they can soften as you prep the remaining ingredients. In the egg yolk bowl, add cream cheese and erythritol. Mix until there are no remaining lumps. If you plan to use the same utensil to mix the egg white, clean off the utensil and dry - you don't want any yolks in the egg white mixture. In the egg white bowl, add the cream of tartar. Using an electric hand mixer mix until the eggs whites form firm peaks. While the bread is baking, place the ingredients for the frosting in a medium bowl and mix using an electric mixer, until everything is combined. Once the bread is done cooking, pull it out of the oven and allow it to cool. Spread a thin layer of frosting on the bread — I find this is best done when the frosting is soft, as oopsie bread is very delicate. 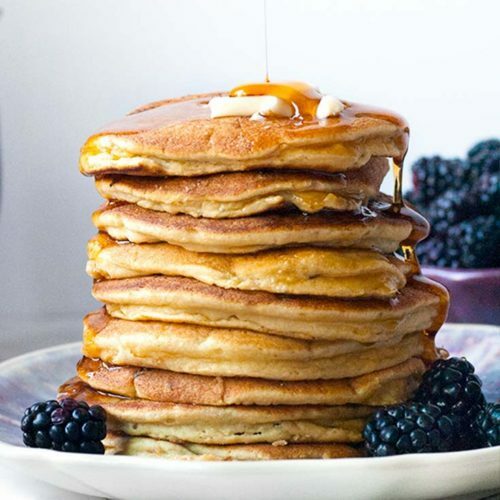 Sprinkle some berries or whatever you’d like on top and enjoy! Thank you Genius Kitchen for the inspiration! As you can imagine, there are a handful of delicious oopsie rolls variations you can make with this recipe. 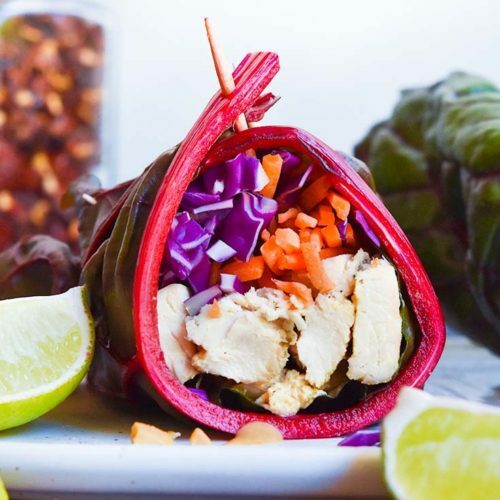 My favorite is to leave out the erythritol and swap the cream cheese with boursin (or a spreadable cheese of choice). Many people have asked if my oopsie bread recipe can be turned into a cloud bread loaf. I’ve tested this a few times without any luck, but will keep you posted! As mentioned above, the bread doesn’t rise much, which hinders its ability to turn into a loaf. Because I know you’re wondering, yes, cloud bread and oopsie bread are the same thing! Just two different names. 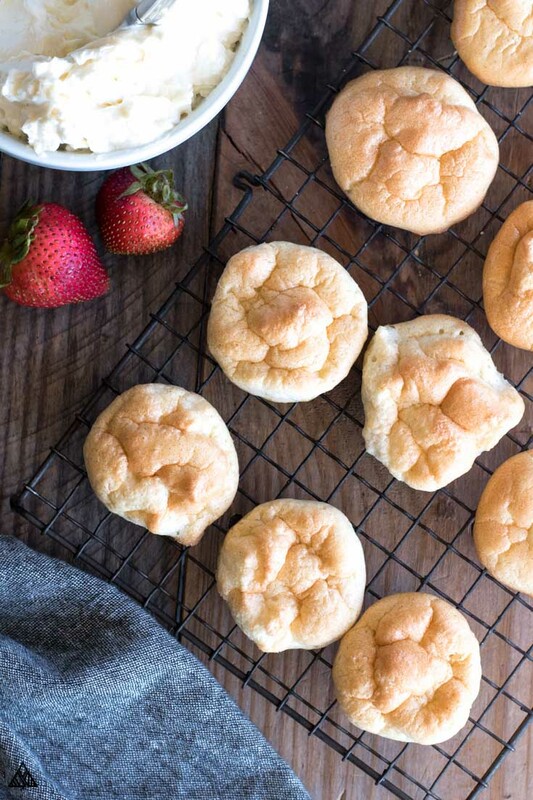 The name cloud bread is a serious indicator of just how fluffy and delicious this bread is! OMG, yum. Now, this sweet oopsie bread recipe isn’t meant to be topped with cheese and pepperoni, but using a traditional oopsie bread base to make a cloud bread pizza will make you never miss regular pizza again! Oopsie bread pizza can be topped with any low carb ingredient you’re craving! I can’t believe how much I really liked this! The bread had just the right amount of cinnamon and sweetness! Then topping it with the cream cheese mixture,,,,,,,,,,,,whoa! Seriously, really Delish! !